The first person you’ll see as you walk into our office or who will help schedule your next appointment as you leave is Alma. Almas’ bubbly personality will make initial paperwork and scheduling your first appointment effortless. 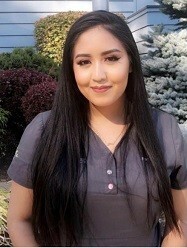 She recently moved to Gresham from California and is the newest addition to the Starkwood Chiropractic team having joined in early 2018. In her free time Alma enjoys playing tennis, going to theme parks, exploring the Rose City, and flying back to California to visit her family in Modesto. When out and about discovering what Portland has to offer , her husband Juan and newly adopted puppies Slinky and Chico are always close by.